STScI-2010-13 The scene is reminiscent of Hubble's classic "Pillars of Creation" photo from 1995, but is even more striking in appearance. The image captures the top of a three-light-year-tall pillar of gas and dust that is being eaten away by the brilliant light from nearby bright stars. 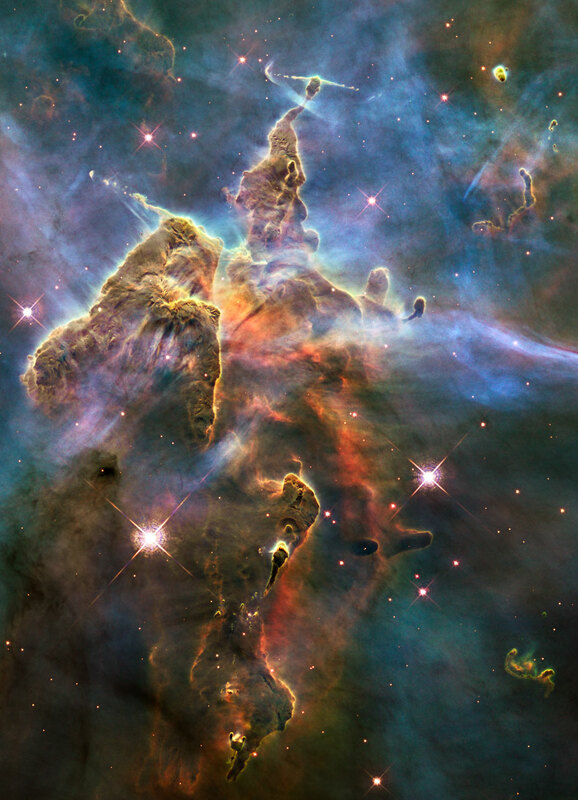 The pillar is also being pushed apart from within, as infant stars buried inside it fire off jets of gas that can be seen streaming from towering peaks like arrows sailing through the air. NASA is releasing today a brand new Hubble photo of a small portion of one of the largest seen star-birth regions in the galaxy, the Carina Nebula. Towers of cool hydrogen laced with dust rise from the wall of the nebula. The scene is reminiscent of Hubble's classic "Pillars of Creation" photo from 1995, but is even more striking in appearance.